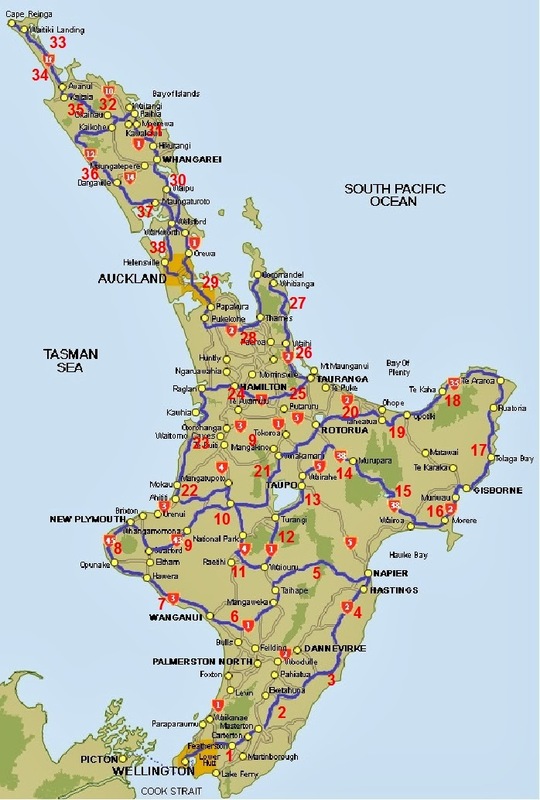 Today, I finalised my cycle route around the North Island of New Zealand. It's another 38 legs of cycling (I might wish that I had 38 legs rather than only my two by the end of all this) and adds a further 4,050km (2,500 miles) of cycling and brings the total trip distance to 7,720km (4,800 miles). That's a scary number. It's a lot of cycling. Heck! That would be a lot of driving in a car, and it's about 8 hours of flying time. 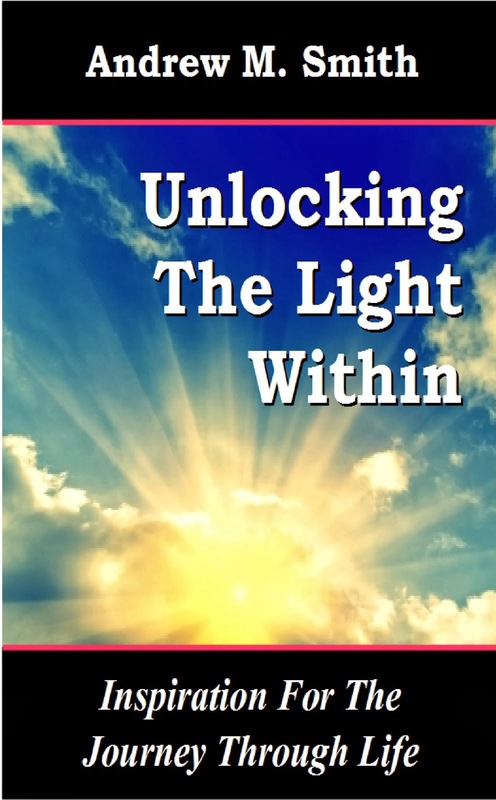 I am beginning to wonder what is it that I am getting myself involved in? It's not too late. I could back out. It is a solo project after all. I would be letting no one down, no one is dependent on me completing this ride, I have a responsibility to no one. Except that is, to myself and that is the most important factor for me. This ride, this adventure, it represents something very significant in my life. It is an adventure of which I have long dreamed and as such, I have imagined many times how it will feel to be on the road, pedalling along, spinning the cranks, legs moving up and down in a perfect rhythm, the dance of man and bike. My route for the North Island was not so easy to decide on. In the South Island, I begin at the north of the island, in Picton, and generally cycle a clockwise route, finishing back in Picton. 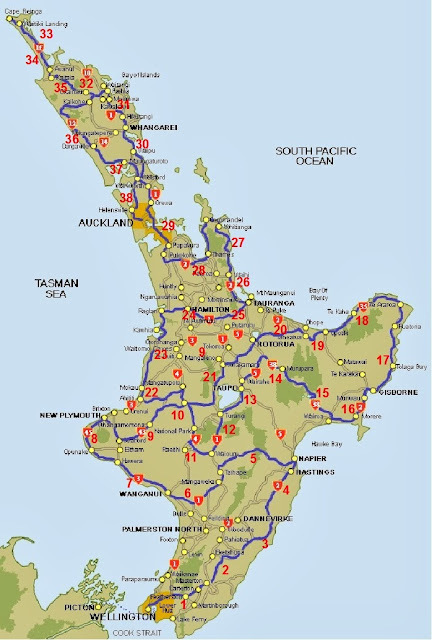 The North Island represents more of a challenge route wise because I will begin in the south of the island in Wellington and finish in the north at Auckland. It is my wish to see as much of New Zealand as is possible, so this means some zig-zagging across the county, from east to west and west to east. As the North Island is more densely populated, this also means more cities and town and the infrastructure that is necessary to support them. This means that the roads will be larger and busier than in the South Island. I'll finesse the route a little more, so that I make use of as many minor roads as possible. One of the problems of this kind of tour in New Zealand is the relative sparseness of major population centres. I'll need to ensure that I have adequate food and water for my journey, so my plan is to pass through one major population centre every day or every other day, so that I can stock up at a grocery store or supermarket. In terms of ensuring adequate water supplies, in the event of emergencies, I will call in on farms and any houses that I spot along the way and ask for a top up from the kitchen tap. If I'm honest, one of my main criteria for passing through towns will be to stop for a coffee at a cafe, catch some internet access, and perhaps a bit of chat with the locals. This is my route for the North Island as it now stands. As before, the route is marked in blue and the red numbers indicate each leg of the tour. There we have it. Route planning is now complete. Now I need to focus on what clothes I will require, what equipment is needed, to think about nutrition on the road, about the practicalities of camping and cycling, what type of shoe/pedal combination I should wear for the ride, should I take a laptop or just an iPhone..? I am sure there are a host of other items that I need to cover before I embark on this journey. The most important thing though, is that I do begin it, because once I begin, I know that I will see it through to the end. Two of my best-ever life adventures happened in the North Island of NZ. One was when I realised I was running out of money way too quickly and I needed to work to top up my account. I got a job in an apple orchard near Napier, picking apples for 2 weeks, from dawn till evening. I learnt what hard labour was there. I learnt to appreciate the taste of freshly picked apples. And I learnt how wonderful it is to be the only female worker in a male-dominant environment - every single guy helped me out each day to fill up my last crate for the day. I would swap my day job any time for 2 weeks of apple picking with the Mauris. The other adventure was doing the Tongariro crossing. Unforgettable. Breathtaking. The most mysterious place in the world. Also, the beginning of a life-long friendship. Will never forget the colours, the rain, the cold, the beauty. I would like to return one day.